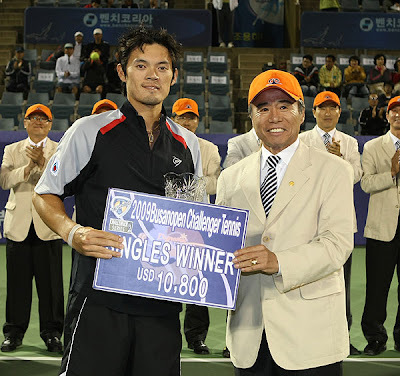 Second seed Danai Udomchoke of Thailand successfully captured his first ATP challenger title this year in the US$75,000 Busan Open in Busan, Korea on last weekend. The Thai 27-year-old avenged his Bangkok challenger final defeat to Florian Mayer with a 6-1, 6-1 victory over the German third seed in the semifinals, then defeated Slovenia's Blaz Kavcic(ATP-243) in straight sets 6-2, 6-2, to win the title. Danai, who recently quit his national team, received US$10,800 and 90 ATP entry points for singles champion. In the men's doubles, twin brothers Sonchat and Sanchai Ratiwatana took home the title after defeating Japanese pair of Toshihide Matsui and Tasuku Iwami in straight sets 6-4, 6-2. It was twin brothers' fifth ATP challenger title this year and the seventeenth in their career. The 26-year-old Ratiwatanas who won two ATP titles in Bangkok 2007 and Chennai in 2008, awarded US$4,650 and 90 ATP entry points.